Light up your off-road adventures with this Monster Treads Lightning Wheels® Tractor by TOMY! 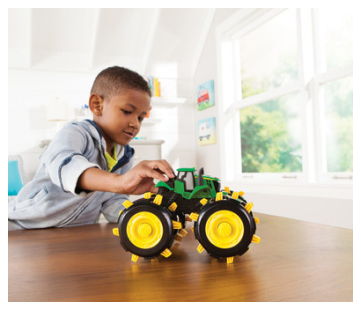 Simply roll the tractor to activate the super cool light up wheels and see the green LED lights come to life! Measuring 9" long, 6" wide, and 8" tall, this monster tractor is ready to topple anything that lies in its path and is perfect for children ages 3 years and older. Batteries included.